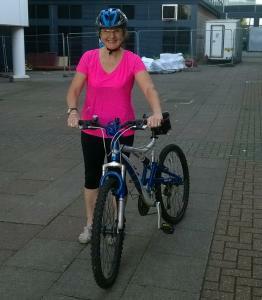 Suzanne has used the Summer of Cycling Challenge to help overcome an injury. Suzanne Le Blond, 51, is a lecturer in Public Health and Community Nursing at the University of Derby. She has used the August Summer of Cycling Workplace Challenge to help get her back to fitness after a knee injury and is looking to carry the momentum from that into Shake Up September'. "I took part in the Workplace Challenge in January, doing some running, pilates, yoga and body blitz, as well as trying a couple of classes at the University that I hadn't done before. "I have also been doing the Sumer of Cycling Challenge in August and, as a result, I have been trying to cycle to work twice a week, which is seven-and-a-half miles to my home in Chellaston. I use a route along the canal which is quite a safe route being mainly off-road. "I find it's helped me being on the Workplace Challenge because it motivates me to keep up with everyone else. There are people at the top of the leaderboard, who I'm never going to be able to catch because they are so active, but it helps comparing myself with other people at a similar level. "When you see your points going on it makes you feel you have achieved something and it helped me build up to do the Derby 10k in April. Suzanne took part in the Moonlight Walk for Treetops Hospice in June,along with six colleagues. "Following that I damaged cruciate ligaments, away from my physical activity, and in rehabilitating from that, August's Summer of Cycling Challenge came at just the right time, because a bit of cycling was a useful way of building myself up again. "I've now been able to get to a point where I can run a bit and walk a bit too, so for the 'Shake Up September' Challenge I will be able to do that too. "I have also been able to use the Workplace Challenge in conjunction with an app I use on my phone, meaning I can then record the distances. When you see how far you have done, it keeps you going. "I have always been into exercising, but now I have a lecturer's job where I can be sat down for long periods marking and studying, as opposed to being on my feet a lot more as I was previously a nurse and health visitor, so I have to try to find time to do activities. "As someone who talks about public health and obesity, I want to practice what I preach, plus exercise is a good way of letting off steam if you feel stressed and helps you put things in perspective. "I have got to know a couple of people through the Challenge, as there are a lot of people doing it at the University. "I am always encouraging people to give the Challenge a go because I know there are people who do a lot more activity than me and I know they would enjoy it. There are probably over 100 staff in the College of Health and Social Care. When you have a busy lifestyle, it gives you that extra push."